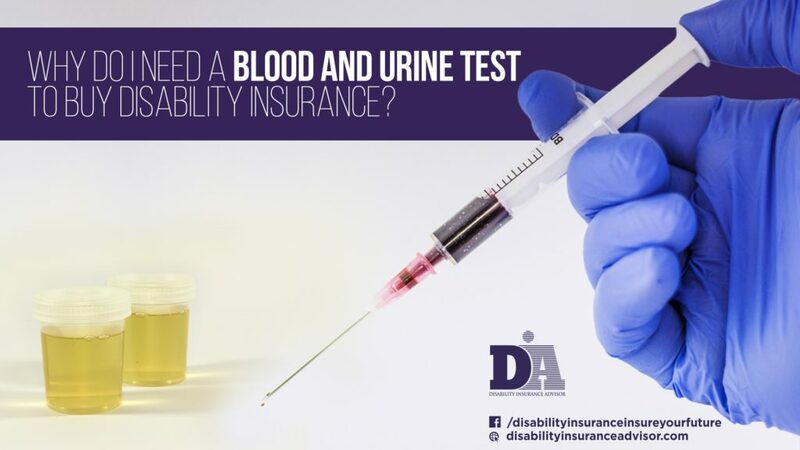 Why Do I Need a Blood and Urine Test to Buy Disability Insurance? So you’ve made the decision to invest in Disability Insurance, congratulations! Protecting your future is a smart and important decision. A blood and urine test is significant piece of getting you closer to being protected by this kind of insurance. Insurance companies take a big risk when insuring someone. When someone applies to their company to be insured, they analyze the information on the application and blood and urine tests to figure out how much of a risk an individual is. This risk is used to determine whether someone will be covered and issued a disability insurance policy. It is essential to a company to see how healthy a person is. Blood and urine tests give a wealth of information into someone’s health, which is why they are requested of individuals that are seeking to be insured. With out these tests, the person will not be considered for Disability Insurance coverage. What Will the Blood/Urine Tests Tell? Insurance companies want to know if there are illegal drugs or nicotine in your system. They also test for hepatitis, cholesterol, HIV/AIDS, diabetes, and a variety of other things depending on the insurance company. Blood and urine test will help categorize you in a risk category, but can also reveal illnesses and ailments that you did not know you had. This will allow you to get treatment and work on your health. Depending on your overall health and risk, insurance companies will determine your insurability and price of your premiums. These tests may seem annoying, but they are an essential piece of the application process. Your determined health can help decide your premiums and an added plus of finding out if you have any unearthed illnesses that should get treated. To learn more about Disability Insurance and the application process, call us at (800) 788-8921 to speak to an agent or fill out our quick Contact Form in order to be contacted by one of our experienced advisors. We can help you start your application process as well as learn more about the medical exam part. We are here to help you secure your financial future.